When I read this brief I was instantly transported back to being a child – I loved any book that explained how things work and I still do. I’d worked with Lonely Planet before on How To Be a World Explorer, which really pushed me creatively. That project required me to draw everything from people wrestling crocodiles, to a super detailed plane cockpit. I was inspired by Stephen Biesty’s detailed cutaway books of engines; I love drawings that make the world seem a little less chaotic and more understandable. I was so excited to finally be able to work on one of these books, I almost felt like I was making it for a seven-year-old version of myself! 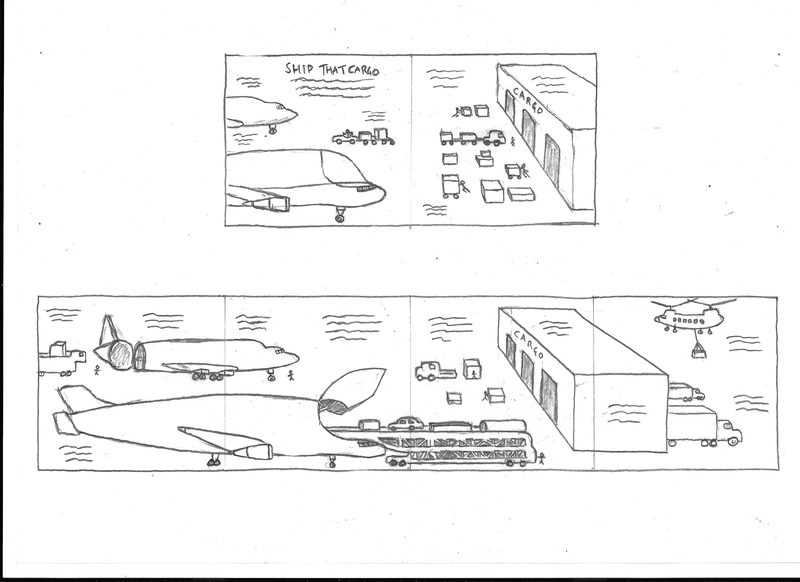 It’s great when clients and editors have ambitious ideas like drawing an entire airport or city. I’d never completed a project like this before and was up for the challenge. I started with rough pencil drawings and traced those to produce final black and white line work. The Art Director at Lonely Planet provided me with preliminary sketches that detailed the layout of each page. Taking people’s ideas and research and trying to turn it into something that is visually engaging is a brilliant challenge. Once my line drawings were approved, I made the final changes and added colour in Photoshop. I did a lot of printmaking when I was first starting out so I approach my work in a similar way now, even when it’s digital. I only use two or three layers: one for the line work, which is then multiplied on to the colour layer below. I used a tablet to do the colour work and painted it in behind the line work. I made final tweaks and finishes before flattening the artwork into the layers needed for the book’s different flaps. There were no major challenges — I’m at a stage now where I feel confident to tackle projects that may push me. If I do the research, it usually works out. It was a little tricky getting to grips with the interactive flaps in the book but it was fun learning how to make it work! It’s really simple: pencil and paper are all I need to make a start. I have plenty lying around my studio! You can make a start on anything with these fundamental tools – from making a birthday card to designing a house. I tend to travel around a fair bit and have managed to adapt accordingly — I can be working out of a backpack and produce the same stuff I would in a 1000 sq ft warehouse studio. I sort of stumbled into illustration. I studied Visual Communications and had always aspired to work in interactive design, but that didn’t satisfy me. I rediscovered my innate obsession with drawing when I went travelling — I sketched every day instead of keeping a diary. Eventually, those drawings were noticed by publishers and some drawings I did of buildings in New York were published in my first book. After this opportunity, I went on to illustrate more books, which I now do regularly. The reward of having a physical object come out of a project is such a delight. I enjoy all the other projects I work on but books are just such an achievement to produce!